Richard Dennis. He is a retired corporate attorney who now lives and writes in northern Washington State. His short story “The Most Wanted” appears in the Winter 2018 edition of the literary journal Euphony. Previously, his story “Request for Reconsideration” appeared in the literary journal The Milo Review. Richard has studied with the Writers Studio Workshops and is currently working on his first novel. Richard recommended that Literary Roadhouse finally get around to reading Faulkner, dangit! And our regular hosts couldn’t be more grateful for his recommendation of “That Evening Sun.” This story’s unapologetic and poignant critique on racism in the American South fueled a lively conversation that could have gone on for hours. Anais sat down with Richard to discuss his writing and career shift from corporate lawyer to fiction author. The interview is available to our patrons on Patreon. 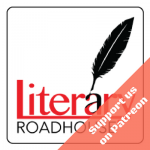 To become a patron, you determine how much to donate to Literary Roadhouse to keep our show going. In July we read Reservoir 13 by Jon McGregor. Winner of the 2017 Costa Novel Award, Reservoir 13 by Jon McGregor challenges reader expectations by subverting mystery tropes and dwelling on the aftermath of a disappearance, such as it may be. Gerald, Maya and Anais were joined by Erika Liodice. She is the author of Empty Arms: A Novel as well as the new children’s book series High Flyers: Rookie of the Year. Erika pens “The Indie Way” column on the popular fiction writing website, Writer Unboxed, and is a contributor to Author In Progress, the Writer Unboxed team’s first anthology. To learn more about Erika and her work, visit erikaliodice.com. Anais sat down with Erika to discuss her novel which is also focused on a missing girl of sorts, and to discuss her more recent adventures in writing children’s books and racing pigeons. Yes, really, racing real pigeons. The interview is available to our patrons on Patreon. This week Gerald, Rammy and Anais discuss Roald Dahl’s short story “William and Mary.” This story’s unexpected turn toward horror and revenge thrilled all three hosts. In addition to discussing character, prose and plot, the hosts discussed whether or not they would undergo William’s procedure in death, and discuss longevity and ego. 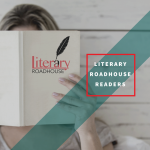 This week the Literary Roadhouse hosts discuss Philip Roth’s short story “Defender of the Faith.” The story succeeded in uniting the hosts’ opinions. The no-frills story captivated Maya, Rammy, and Anais, and leads to a discussion of how Philip Roth portrays Jewish people and the controversies that surrounded his characterizations. In June we read The Sympathizer by Viet Thanh Nguyen. Next month we will read Reservoir 13 by Jon McGregor. Winner of the 2016 Pulitzer Prize, this gripping novel centers around a mole in the Vietnamese army. The story follows his journey after he flees Vietnam. The book is often funny, sometimes horrifying, and always clever. Gerald and Anais were joined by Gael Gilliland. She is the founder of The Legacy Recorder (www.thelegacyrecorder.com) which helps people preserve their favorite moments and wisdom for generations to come. The Legacy Recorder works with both individuals and assisted living facilities to help preserve individual’s life stories. If she looks familiar, that’s because Gael had previously joined our weekly show for a discussion of The Kitchen Child by Angela Carter. On today’s podcast, we welcome Colette Sartor. She is an award-winning short story author and essayist. Her works have appeared in numerous publications, including The Chicago Tribune, Kenyon Review Online, Carve, Slice, and Colorado Review. She teaches at UCLA Extension Writers’ Program as well as privately. In addition to writing and teaching, Colette is an Executive Director of CineStory Foundation, a mentoring organization for screenwriters and TV writers. For more information, please visit colettesartor.com. By the way, we discussed two of Colette’s short stories. Listen to our discussions of La Cuesta Encantada and Once Removed. Interview bonus! To listen to our author interview with Colette on Youtube. She and Anais discuss the CineStory Foundation, and how to write vulnerably. Colette also shares how she manages loved ones who see pieces of themselves in her fictional characters. As for today’s story, Colette and the LRH hosts discuss The Proxy Marriage by Maile Meloy, a romantic short story with a rare happy ending. Unable the find any flaws, the podcast quickly becomes a love fest. The hosts and guest fawn over the elegant prose, brilliant pacing, and smart time markers and structure. Stay for some surprising wedding facts in the game at the end of the show. We’re still a self-funded podcast. We work hard every week to bring you the best content possible. Help us cover our expenses and meet our goal of bringing you the best literary discussions of short stories.